Think Babies Born With Down Syndrome Aren't Smart...? Think Again! 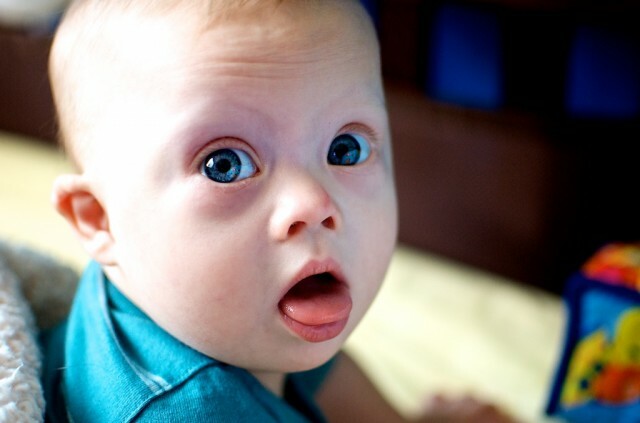 You are here: Home / Parenting / Think Babies Born With Down Syndrome Aren’t Smart…? Think Again! I sometimes say that our little boy reminds me of a Muppet Baby because of all the zany adventures he has in his crib when he thinks we aren’t watching. (If you don’t get what I’m talking about do yourself a favor and watch a few episodes…you can thank me later!) Like today for instance…..
Dad Get’s Played By A 9 Month Old….Again! Just look at those big, blue eyes! After feeding him a nice, yummy, lunch he started to close his little eyes and get all cute and cuddly which typically means it’s nap time. So I tip-toe into his room, quietly lay him down, and tip-toe back out. Ahhhh…Noah’s finally enjoying a much-needed nap…and dad finally gets to work on a few things. Within just a few minutes of me leaving his room (where he was sleeping like the baby he is) I hear a mini-party coming from out of his nursery. I just laid him down….he was sound asleep…..what in the world is going on in there??!? You’ve got to be kidding me! Are you telling me this little boy pretended to go to sleep, allowed me to lay him every so peacefully into his crib, managed to stay in character all the way until he was 100% sure I was long gone…and then decided to have a party in his crib….? Wow. That’s my boy! Whoever thinks that children born with Down syndrome aren’t smart (and even a little manipulative at times) little cookies should just spend a day in our house. Our little boy may only be 9 months old…be he already knows how to play the game. Well played baby Noah, well played. Have you ever caught your little one ‘playing’ you? Tell me about it. omg he is so cute! 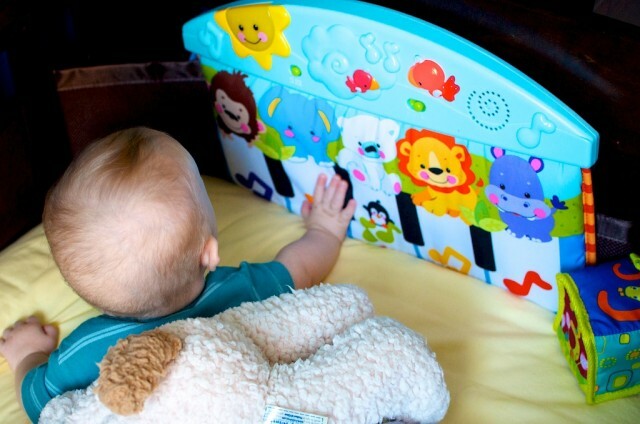 i love that piano toy….where did you get that and what is it called? Thanks! We agree, he is a cutie. That piano is one of his favorite toys. We even included it on our top ten gift ideas post. Love this!!! I have been played many many times by my sweet darling Shae Bug (and so have her teachers and other family members). For example, my brother, Davis, voluntarily took both of my children to a local children’s science museum, Sha…e (7) and her little brother Jaxon (5), I warned him “take reinforcements, Shae’s a flight risk” but…NO…he ventures out with both of them in tow. When I get home later that day I hear the story of how Shae gave “Uncle Vavis” a heartache. She disappeared for about 30 min, when he finally tracks her down she says “haha, you found me!!”. Apparently she thought they were playing hide and seek. She thought it was quite fun, “Uncle Vavis” on the other hand was none to happy (and neither was mom)!! Keep up the stories, I love to hear that I’m not the only parent out there that experiences this stuff. You’re not the only one by a LONG shot! “Hide and seek”…! I like that! She sounds like a ton of fun! I bet you guys have a blast! 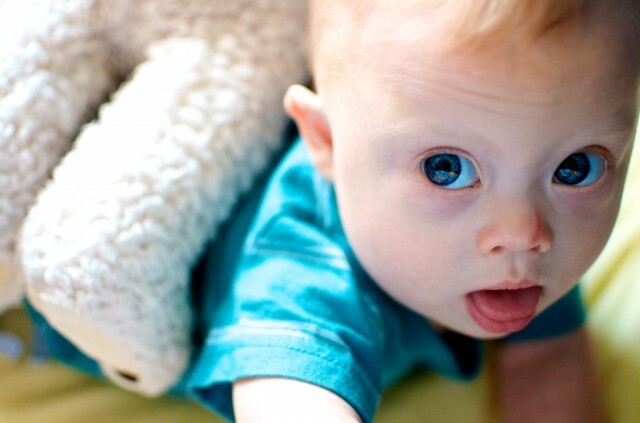 Hi, I have a 25 year old son with Down Syndrome. Eric was a true blessing to our family as well as others. When he was younger, he could steal your heart, as he does today! We learned many things through Eric. Eric taught us that love is very unconditional no matter what. He also taught us that it is alright not to be perfect, but as we know, he is the perfect one. Eric loves movies (Pirates of the Carribeans, Harry Potter, and NCIS which is his favorite, as he tells us that when he growsn up he is moving to New York to be a forensic person. I have learned through the years to be very patient with what Eric has to say. He knows what he wants and he will presevere until he is able to communicate what it is. We have been blessed with Eric’s health. He had a Duodenum Stynosis surgery when he was a year old and have not had any other health issues. I pray for Eric, your son, and all of the developmentally delayed people that life can bring them as much joy as they bring us! So glad you have this link, it is awesome!!!!! So great to hear from you again! I am sorry to hear that Lutfil has the chicken pox by the way (you shared that on our Facebook page.) I prayed for him tonight, I hope he gets better very soon. You sound like a very loving mother, and Lutfil sounds like a great boy. I wish we could meet him! I still remember when you posted his picture for us, I was so happy to see him! I just found this site (my friend Jacolyn posted the link from the Target ad story). She has 3 beautiful triplets (2 girls and a boy). One of the girls, Grace, has CP, an my friend said “Grace would make a terrific model”, and so she would! Also I am a pediatric nurse working at a small Pre-School/Child Development Center that serves many “special needs” kids and some “typical” (I hate those awful designations, by the way: all children are special and they all have needs!) Anyway, I am already in love with Noah! What a doll! I have had in my care a couple of kids wth Spina bifida, 3 with severe seizure disorders, 2 with autism and 3 precious little ones with Down Syndrome. I must say, they are my favorites! They are very smart, and charming, and beautiful exactly the way they are. I wouldn’t change a thing about them (well, OK, maybe the one little guy’s fascination with spitting, but..) I get to witness miracles every day that make life so much more precious and sweet. It’s awesome how the children don’t point out the “disabilities” of their friends. They just say “that’s my friend Andy”…”oh, that thing on his leg (brace)… that’s just how he walks.” It’s so good that the “typical” kids get early exposure to differences among their peers, and that the “special” kids see what their peers do, and don’t doubt for a minute that they can do it too. Well, I will pray for Noah’s heart condition to be healed; please pray for one of my little sweethearts, “M” (can’t share her name) She has very fragile lungs (she was a preemie as well as having Down syndrome). She is in the hospital struggling with a severe respiratory infection. I’m so glad i found your site and I will definitely tell my friends about it. God bless you! Hello Noah’s Dad, I’m so glad to read your writing. I also have a baby like you, age 3 months. I love to read your writings and inspired me to take care of my child. By the way, do you have any children? We love hearing people’s stories. Hi! I’m Matthew’s mom. A ten year old with down syndrome. I thought it was me. I thought no way is that smart thing happening. What is smart? When people who are smarter then you tell you your child has down sydrome it is given as “bad”news. As you search for answers from other smart people and you start to feel dumb. Ok don’t laugh…I knew very little about raising a child with down sydrome. I raised a dog, a cat, and a baby brother. Forgive me but, that was my resume. After he learned to walk at two, he started going after the things he wanted.Things that did not belong to him, such as videos, lipsticks, and toothbrushes. After running out of hiding places, my husband suggest we placed them up high, out of his reach. Problem was, he saw where we place the items. We had no clue how dumb we were. Matthew pulled a stool up to the kitchen counter and climbed up and grab the videos all the while he just looked at us. I stood there thinking, omg, he can problem solve, he is not dumb, I am! No one had told me that! Ok, there was one lady but in my defense, I thought she was drunk. Anyway, she grew up with a sister who had down syndrome and she said her sister was smart. I just didn’t believe her. Yes, I have learned the hard way how smart my son can be. At ten he is a movie critic. He chooses the film he wants us to see and if it is not interesting or boring, we are out of there. He hated ” Tin Tin” and ” Thor” loved “Harry Porter” and “Stars Wars 3d” Who can agrue with that? You are just starting out with Noah. Have fun, laugh, brag,and show him off. Someday, I’ll tell you how my son cons strangers into giving him stuff!!!!!! My little boy Ryan is super smart! From the moment he could grip my finger with his little strong grip hand he has used it to show me exactly what he wanted. Before he got his first tooth he took my finger and placed it where it hurt then placed it on the same spot in my mouth.If he wanted a drink he would take my hand and throw it towards his drink or anything else he wanted. He uses my finger to point out words and pictures in books. Before he was 1yrs he not only recognised his own name and other words when written but new that capital E and little e was the same letter! He’s now 21mths old and knows all his letters, numbers, colours and animals and food. Ryan loves sitting on his nans knee reading her cook books! he knows all the moves to his favorate songs. And we have sat for hours at the laptop picking songs on utube for his own list( we now have fifty songs) I’m sure if he could talk he would sing along to every word! !